Could we be doing more to fight breast cancer? Excerpted with permission from "The End of Breast Cancer" by Kathleen T. Ruddy, M.D. Copyright 2017, Skyhorse Publishing. Available for purchase on Amazon, Barnes & Noble and IndieBound. I first learned of the breast cancer virus in February 2007. It happened quite by accident. Kenneth A. Blank, MD, a radiation oncologist who was a member of the breast service at the Clara Maass Medical Center where I worked, had attended a breast cancer review course in New York City that January and brought the handout to our weekly meeting. He handed it to me with a knowing smile, for he knew I read everything I could get my hands on. I accepted the gift gratefully, with an equally knowing smile. Ken mentioned there was something in the handout about a breast cancer virus. I thought, What? When I scanned the document during the meeting, I found two PowerPoint slides presented by James F. Holland, MD, at the San Antonio Breast Cancer Symposium in December 2006 about a breast cancer virus—something I had never heard of and never dreamed existed. When I got home that night I read the handout more closely, but because it was just a brief summary and two slides, there wasn’t much to learn from it. The next day I asked Arlene Mangino, my hospital librarian, to pull the entire paper Dr. Holland had presented in San Antonio so that I could study it more thoroughly. I also asked her to pull anything else that he had written on the subject. Surely, I thought, this couldn’t have been his first and only paper about the breast cancer virus? Just before I left the library to return to my office—more as an afterthought than a plan—I asked Arlene to conduct a complete literature search about this virus. I reasoned that other scientists might have written a paper or two on the subject, and I wanted to have as much information as I could reasonably gather as I set out to learn about this most unexpected thing—a breast cancer virus! I was confident that Arlene would probably unearth a handful of articles, and that I’d be able to polish them off in a few hours. I was sure I’d be brought up to speed with the amazing discovery of this breast cancer virus in no time at all. And while I waited for Arlene to get back to me with her literature search and all the articles, I mentioned the virus to everyone I saw over the next few days. No one had heard of it either. Everyone was surprised to discover that such a thing existed. When Arlene appeared in my office a few days later with a stack of articles two feet high, I was shocked. The first article about the virus was written in 1936. I wondered how there could be so much published material going back decades on a subject as important as this, and I had never heard of it before. Then I panicked. Had I fallen asleep during a lecture about this virus? Had I missed reading about it in one of the many breast cancer textbooks that line my shelves at home and work? Had I failed to pay attention during some discussion with my colleagues? I immediately checked my textbooks for references to the virus. Nothing. No citations anywhere. I felt relieved, but not by much. I glanced at the stack of papers piled high on my desk and got to worrying all over again. Never mind the data: What was the history behind this research? Why had it only recently come to the surface at San Antonio? Clearly, I had a lot to learn. At that point, I thought the best thing to do was to put the articles in chronological order so that I could better follow the logical progression of the research on the breast cancer virus, and I would try to ferret out the political history that had shrouded it later on. I started reading the articles and kept at it for about a month until I finally got to Holland’s paper, published in 2006. It was quite a slog, but the more I read, the more intrigued I became. Meanwhile, I was also in the middle of an exceedingly demanding master’s program at McGill University in Montreal and was busy traveling the world, creating an international breast service, and preparing my research thesis. I was still running the breast service at Clara Maass, too. Between patients, before bed, on planes, in trains, and during holidays, I read everything I could find about the breast cancer virus. Invariably, I would read one paper and then ask Arlene to pull the references cited in that article. It was like pulling threads on a Persian carpet. There were more and more papers to read, and the more I read, the more I wanted to know. A few months later, as I was finishing my master’s program at McGill and wondering what I would do with my expertise as a breast cancer surgeon and my new degree, I began to reflect on what was the next best thing to do. I thought, I’m a breast cancer expert. I’m an international health care leader. Why don’t I create a foundation whose mission is to understand the causes of breast cancer and to use that knowledge to prevent the disease? Yes, that’s exactly what I’m going to do. And while I’m at it, I’m going to see what I can do to bring more attention to the subject of this breast cancer virus. After arriving at this decision, I called my attorney, Jeff Pompeo, and told him I wanted to create a breast cancer foundation focused on prevention, one that could bridge the gap between the cure and the causes of the disease. In April 2008, we filed the necessary papers to obtain a 501(c)(3) nonprofit status from the IRS for the Breast Health & Healing Foundation. Its official mission is as follows: “To discover the specific causes of breast cancer and use that knowledge to prevent the disease.” The paperwork was the easy part. The hard part—something quite new to my repertoire—was to figure out a way to raise awareness and money for research on the breast cancer virus. According to my back-of-the-envelope calculation, less than $100,000 a year (of the hundreds of millions of dollars spent annually on breast cancer research) was given to scientists who were working to identify the human breast cancer virus. How can I change this sad arithmetic? I wondered. Well, I didn’t know anything about raising money, but knew how to write—it had been my first love in college. So I created a blog and began to write about the primary prevention of breast cancer, and I emphasized the importance of supporting research on the breast cancer virus. That certainly got some attention. My blog has since won two awards, and if you do a Google search on the breast cancer virus (a.k.a. the “pink virus”) you will find my name and website mentioned. But that wasn’t enough. More women needed to know, not just those who poked around on the Internet and found their way to me. I held two summits on Capitol Hill about the virus. I cosponsored another summit in New York City with the help of the Harvard School of Public Health and Loreen Arbus of the Arbus Foundation. I made this project my “Commitment to Action” for the Clinton Global Initiative. I made a public service announcement about the virus, a short documentary film ("It’s Time to Answer the Question") that was nominated Best Film of the Year 2010 by Rethink Breast Cancer, a Canadian breast cancer foundation. And then I thought, I must write a book about the virus. Women need to know! 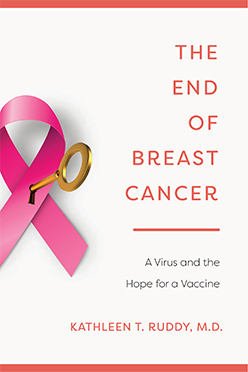 My goal in the book is a simple one: tell a good story that will draw enough attention to this research that scientists who are working on the breast cancer virus can get the money they need to finish their work. You see, I believe that answering the question “Does a virus cause breast cancer in women?” has the potential to change the life of every woman on the planet. If scientists were to prove that this breast cancer virus is responsible for a large portion of human breast cancer, it would change our entire approach to the disease. The “Pure Cure—Prevention” could begin in earnest. Scientists could screen women to identify those who are infected with the virus and are therefore at an increased risk for breast cancer, just as we now screen women for the human papillomavirus (HPV) that causes cervical cancer. Scientists could design interventions, like antiviral medications, to reduce the risk for breast cancer in women who are infected, just as patients who are HIV positive are given medication that prevents them from developing full-blown AIDS. Doctors could identify breast cancer survivors whose tumors were caused by the virus and develop specific therapies to reduce their risk for recurrence and death. But we can’t do any of this until the investigations are complete and the proof is in. Yes, we can continue to fight the War on Cancer that President Richard Nixon launched in 1971 in the same fashion and with the same entrenched rules of engagement that have prevailed for the last forty years: diagnose, treat, and work hard for a cure. Patients have been and will continue to be thankful for everything doctors can do to help them in their fight, and they will be forever grateful when the treatments they subject themselves to deliver a durable cure. Our great scientists can continue to make incremental and occasionally impressive advances in the way cancer is diagnosed and treated, even though the unremitting rise in the number of new cases will soon be a burden that no country, not even the wealthiest, can afford. All of these converging activities have made a huge difference in the lives of patients over the past four decades, and, no doubt, they will continue to do so. But it’s simply not enough. If a large portion of breast cancer is preventable because it is caused by a virus, then wouldn’t we be better served if the leaders of breast cancer philanthropies and directors of the relevant government agencies moved more definitively toward the “Pure Cure” (i.e., primary prevention of breast cancer) by taking deliberate, forceful, and committed steps to provide the money necessary to complete this research? I can’t help thinking so. Surely, millions of women would have given anything to have been spared their early, tormented deaths, if not for themselves, then certainly for the sake of their children.